My grandmother was a quilter all her life and when she passed I was given a pile of her UFO's (UnFinished Objects = quilts) and her old Dressmaker sewing machine. The most unnerving of her UFO's was a large Texas star that was a mess. She'd taken it apart and restitched it a couple of times before putting it aside. I looked at it for a long time before deciding I needed to learn how to quilt before tackling that job. 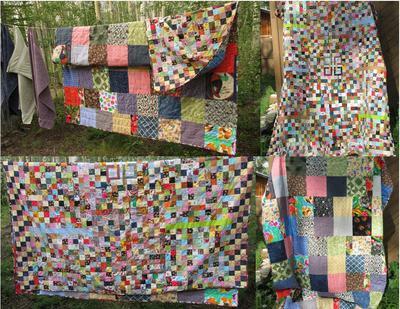 Since then I've made more than 20 quilts and "the mess" is still waiting for me to get the courage to finish it. This quilt is my 20th (or so) and I made it because I love scrappy quilts. It has bits and pieces from several of my previous quilts. I made the Irish Chain block in the middle and didn't want to make anymore so I incorporated it into this quilt. I also used strip piecing and nine patch blocks. The back is pieced from 10x10 inch blocks and this is my largest quilt ever at 80"x98". I couldn't face "quilt-wrestling" the whole thing through my machine so I stitched-in-a-ditch the outer 10 inches and around the center block. Then I hand-tied the rest of it. I had an ugly/busy fabric in a multi-colored print that I made the binding from and I love it. The colors worked well to bring the quilt together. I spent more than a year making it and all of the fabric came from scraps bought at the thrift store. Love the idea of a "Happy Room"! Thanks for the encouragement Debopp! I've been "living" with my Postage Stamp Quilt on our bed and I still find things to love about it. That fussy Celtic Knot block does make its own statement in the midst of all that color. I look forward to seeing some of your quilt stories here. It's always fun to share those "organized cacophony of color" quilts when they get done! I love your quilt! The center block really sets off the postage stamps. What a great way to use an extra block and then move it on to kick off the next scrappy Q! I, too, cannot keep to one project and have several quilts going at any one time. I have a dedicated "HappyRoom" so I can leave them out and admire my works-in-progress. It's an organized cacophony of color! LOL. My posting may be a little bit misleading as I said it took me a year to make this quilt. It did, but during that year I finished more than a dozen other quilts including my Road to Oklahoma one posted on another page. My workspace has room for about 5 projects. If I want to do another quilt, I make myself finish whatever's closest to being done and I NEVER put my UFO's in a closet/cabinet or the old rule of "out of sight/out of mind" would kick in. More like "Words of Encouragement"
Thanks Jackie! I really like the pieced back also cause it added a lot to the overall quilt. Since I made that one, I've been cutting 10.5" squares from worn out shirts, large scrap pieces, old sheets, etc. to be able to do pieced backs whenever I want. I have a huge stack of them now. P.S. I think it also helped that there's so many scraps from my previous quilts. This one carries the memories of the others that were given away. I'd like to make one of these postage stamp quilts...do you have any words of wisdom to pass along on making it? And not giving up part way through? That's a whole lot of work! It's wonderful. To top it off, I love the way you pieced the back, too!